Employees work hard for the money that they are paid, so it can be discouraging when they are injured at work and cannot continue to do their job. Luckily, every state has worker’s compensation benefits that allow people to receive financial help when they sustain injuries on the job. The process of filing a worker’s compensation claim can be difficult, and the insurance companies that provide these types of payments will do their best to pay as little compensation as possible. This is why it is a good idea for you to quickly call a lawyer for help with the process. Workers with lawyers usually receive more benefits than they would on their own. It is still important, however, for a worker to know if their injuries are covered and what their benefits will be. What Injuries Does Worker’s Compensation Cover? Worker’s compensation covers just about any injury that a person may experience while at work. Even injuries that are caused by an employee’s own neglect are covered. This means that a worker could hurt themself by loading boxes the wrong way and they would probably still be covered. There are some instances, however, where an injury may not be covered by worker’s compensation, but all of these situations are avoidable. What Injuries Does Worker’s Compensation Not Cover? Injuries that occur due to a worker being under the influence of alcohol or illegal drugs are not covered. Injuries that are self-inflicted are not covered. This includes injuries sustained by an employee starting a fight. Injuries that are sustained while a worker is going against company policy are not covered. A person injured while not working cannot receive benefits. Any injury that occurred while an employee was committing any serious crime is not covered. What Expenses Does Worker’s Compensation Cover? If a person is injured while at work and the injury was not caused by any of the previously mentioned circumstances, there are several benefits that a worker will receive. This compensation does not include payment for pain and suffering, but it will cover a person’s financial difficulties that are related to the accident. Compensation for any injury that is permanent. Monetary repayment of income that is lost due to an employee not being able to work. Coverage of all medical costs related to a person’s injury. Costs that are related to retraining an employee. Benefits are paid to a worker’s family if that person happens to die from an injury sustained on the job. When Should a Claim be Filed? A worker who is injured on the job should alert their manager right away and seek medical attention. There are deadlines to filing worker’s compensation claims, so it is important to contact a lawyer as soon as possible to get the ball rolling. 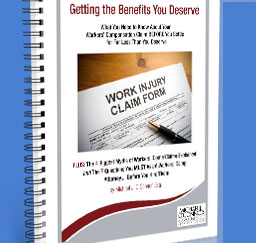 This will guarantee that an injured worker receives all of the benefits that they deserve. With this information at hand, you can make the smartest decision for yourself regarding worker’s compensation, and get the financial compensation that you deserve.